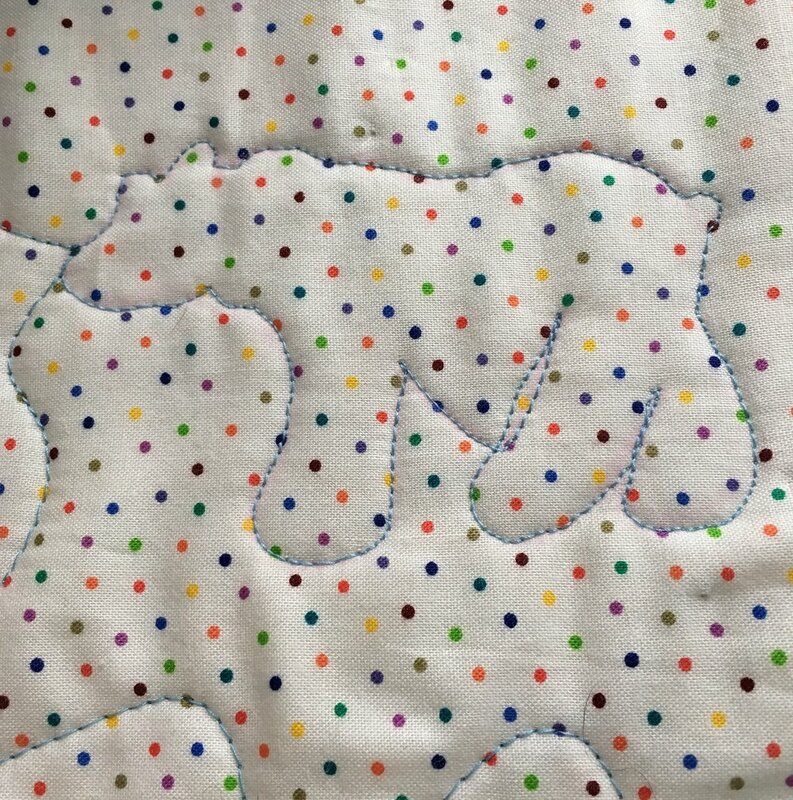 I had so much fun using free motion quilting for my "Bears in the Meadow" queen size quilt. I quilted it with my domestic Bernina 440. The quilt is a Bear Paw Block quilt with a modern layout. I'll show the whole quilt in my next post. I decided it would be fun to but a couple bears into the quilt. I can stitch rabbits and carrots free-hand but from my initial bear sketches I knew I wasn't going to be able to free-hand stitch a brown bear! I did a search of brown bears in Google Images and then came up with a drawing of a bear that I liked and thought I could stitch. I thought about cutting a plastic template but thought it would be difficult to cut smooth lines. Then I thought about making copies of the bear on paper and stitching over the design on the paper. That works but sometimes the stitches get pulled removing the paper and the stitches need to be very small which wouldn't match the other quilting. I ended up just cutting out my bear drawing. I used a Clover Water Soluble Pencil to trace around my paper template. This pencil can be sharpened to a point and I find it rubs off easily like chalk. In fact it rubs off so well, that I needed to trace the bear just before I stitched it. If I pre-marked a block, I couldn't find the bear when I got the the block! The The paper template held up remarkably well. The photo below was taken when the quilting was all done. Here are two bears traced out on fabric and at the bottom, a quilted bear with the marking still visible. Every bear came out a little bit different. I love that! I loved being able to put the bear in different places on the blocks using my cut out template. This worked really well. It's a technique I would happily use again!